Who should be the final picks for the Ryder Cup teams? American Ryder Cup Captain Jim Furyk has to select three of his four picks this week to round out his team and the final one next week. Bryson DeChambeau would appear to be a lock given his two playoff victories while Phil Mickelson and Tiger Woods are #10 and 11 on the points list. The rankings list shows Xander Schauffele, Matt Kuchar, Kevin Kisner and Tony Finau as the next highest players. Who would you select as the final member of the 2018 team. Jim Deeks, Fairways Magazine (@jimdeeks): I’d go with Schauffele. It seems unfair to bypass him and go with somebody else who hasn’t qualified. Simple as that. Michael Schurman, Master Professional / Life Member, PGA of Canada: I agree Tiger, Phil and DeChambeau are the most likely choices even though Tiger and Phil have not enjoyed success equal to their tour records. Wouldn’t it be a shocker if JF saw it this way and didn’t take either one of them? Tony Finau has earned the spot but given the course in France, a good pick might be Kyle Stanley who is very strong in every department required to play there. But he’s a little weak in putting and that doesn’t bode well. Dave Kaplan, Freelance Writer (@davykap): I would select Finau and I wouldn’t even have to think twice about it. Finau had three runners up this season, three Top 10s in majors and has been in contention in each of the first two rounds of the playoffs. He’s also ranked 11th in total strokes gained, 13th in strokes gained from tee to green, 3rd in driving distance, 2nd in total eagles, 10th in total birdies, and 15th in putting average. Most importantly, though, he hasn’t three-putted in 171 holes! Any manager worth one’s salt knows that you always go with the hot hand! Easy choice. Peter Mumford, Fairways Magazine (@FairwaysMag): All four would be great additions to the US team. Finau has the hot hand right now, so I’d give him the edge but if any of the other three wins next week in Philly, that makes it very tough for Captain Furyk. I think in addition to the four captain’s picks, the captain should also have the right to remove one of the top 8 qualifiers if that player goes into a slump. Wouldn’t that ratchet up the entertainment value. 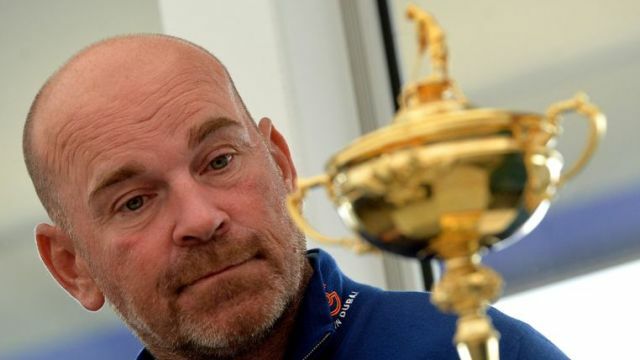 European Captain Thomas Bjorn has a different problem in selecting his team as he already has several of Ryder Cup rookies and will likely be looking to add experience. Russel Knox, Eddie Pepperell, Matthew Fitzpatrick and Rafa Cabrera Bello are in the #9-12 positions on the ranking list and #13 Matt Wallace won last week. However, Bjorn could reach farther down to select #16 Henrik Stenson, #22 Ian Poulter or even #24 Sergio Garcia. If you’re the European captain, which four players do you pick to round out your team? Deeks: Again, I’d go with the players currently ranked. It’s very tempting to go with tried-and-true players — especially Stenson, Poulter and Garcia — but presumably all the others worked their butts off to get picked, and they deserve it for the efforts they made. Schurman: I always favour going to the Money List because those guys have earned it. However, Poulter and Garcia are great attributes and it’s difficult not to take at least one. I’d take Poulter over Garcia based on current form. Stenson is a little off right now and doesn’t bring the added dimension. BTW I’m not a fan of choosing a young player to give them experience. Tour careers can be short and it’s possible the guy you pick from a future growth point might never qualify again. It happened to the USA team. Kaplan: With 5 of the 8 qualifiers being Ryder Cup rookies, I would ignore the rankings and go with experience. My captain’s picks would be Henrik Stenson, Ian Poulter, Sergio Garcia and Thomas Pieters. I realize that Pieters has only cut his teeth at one Ryder Cup in the past and is not coming off a career season. However, the Belgian formed an undeniable chemistry with Rory McIlroy at Hazeltine and Bjorn would be a fool if he didn’t try to rekindle that mojo. Mumford: Bjorn has to go with experience, which means Stenson and Poulter for sure. Garcia is #22 and playing poorly of late, while old stalwart Lee Westwood is only two more positions back and currently playing quite well, but I’m not sure I could count on either when it mattered most. I’d round out the team with #12 Rafa Cabrera Bello, who is very much on form and #20 Thomas Pieters. Both have some Ryder Cup experience and Pieters was brilliant as Rory McIlroy’s partner last time out. A few weeks back, the USGA and R&A announced that they would be limiting the use of green reading books starting in 2019, suggesting that the currently available information is too detailed and reduces the necessity for players to develop their own green reading skills. Have the green reading materials gotten out of hand or is this another nothingburger cooked up by the Rules associations? Deeks: Pretty unnecessary, in my view. Frankly, if you have the ability to understand some of these convoluted green-reading sheets, then you deserve to be able to use them. You still have to make a proper stroke to sink the putt. If they’re banning green readers, why don’t they ban all forms of written advice, like notebooks and sprinkler head yardages? Or blind shot poles? Come to think of it, why don’t they force all players to play with blindfolds? Schurman: The USGA is once again swimming upstream with the greens maps and they have their hands full with DeChambeau. This guy is looking at the game from an entirely different point of view. In the past players learned how to play using their natural skills and then added a bit of science. DeChambeau sorts out the science and then tries to find a way to get his talent to produce the results. IMO players can use any source of information available without measuring it during the round. FYI, Rangefinders give information that is already provided beginning with the yardage marker signage and in-ground plates. Until someone finds a replacement for ‘feel’ all is not lost. Kaplan: I completely support this change. Green reading is supposed to be a skill. The contours should never just be plotted on a graph or an image. The vast majority of us amateurs do not rely on little illustrated books to putt; we use our eyes, our intuitions and our memories. Professionals should be forced to do it the same way that we do. Mumford: The Rules of Golf stipulate that you can’t ask for advice, but you can ask about things that are generally available like the yardage on a sprinkler head. If everybody has a green reading book and it shows the slope on the green, is that generally available information? If so, is it OK to ask your competitor which way your putt breaks? Presumably a silly question but I don’t like the direction all this is heading. I’d ban the green reading books. Players need to figure this stuff out for themselves and some will do it better than others, hence it is a skill, and should not be diminished by levelling out the field with artificial enhancements. While were on it, I’d ban all distance measuring devices too and force players to use their eyes. Whatever happened to globe cedars at the 150-yard mark?